Recently, Emsisoft released a new anti-phishing extension for Chrome and Firefox. We have been receiving email from some Chrome users who say that the Emsisoft plugin is slowing down the Chrome browser on their computers. So far, we have not noticed any slowdowns after we added the Emsisoft extension, everyone’s computer is different. 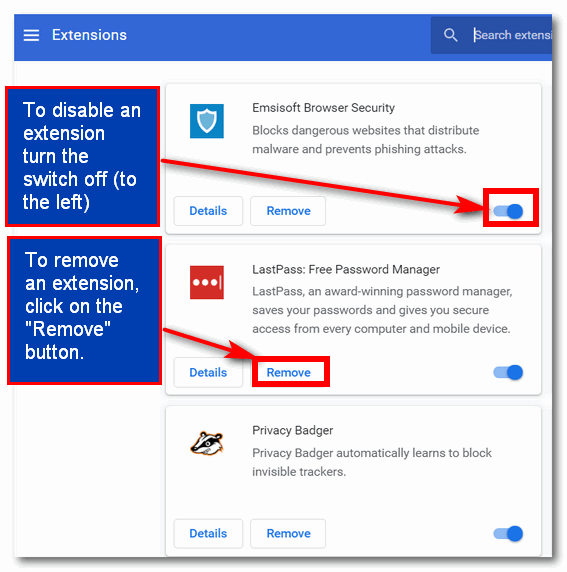 You can turn the Emsisoft extension off or remove it from Chrome… the same way you can turn any Chrome extension off – or remove it from Chrome. So… this tip not only applies to the Emsisoft extension – it applies to all extensions which have been added to Chrome. If you feel an extension is causing problems with Chrome, you have two easy options: You can disable the extension or your can remove it. Disabling the extension retains the extension, but stops it from running. You can, if you choose re-enable it should you want to do so . If you remove the extension it will be completely removed from Chrome. However, you still have the option to reinstall the extension in the future should you ever want to do that. When the Extensions dialog opens, you’ll see all of your extensions. If you want to disable an extension, look for the on/off switch and slide it to the left (off). In the screenshot above all extension are turned on. You can tell by the switches. Slide the switch to the left and it will turn the extension off – but not remove the extension from Chrome. As you can see by the screenshot below, it’s easy to tell when the extension is turned off. When you slide the switch to the left to turn off an extension, the switch becomes gray and white… as you can see below. You can turn the extension back on by sliding the switch to the right. When the switch is on it will be colored blue. If you no longer want an extension and want to remove it from Chrome, just click the “Remove” button. You’ll be asked to confirm that you want to remove the extension. Once you confirm your action the extension will be removed. 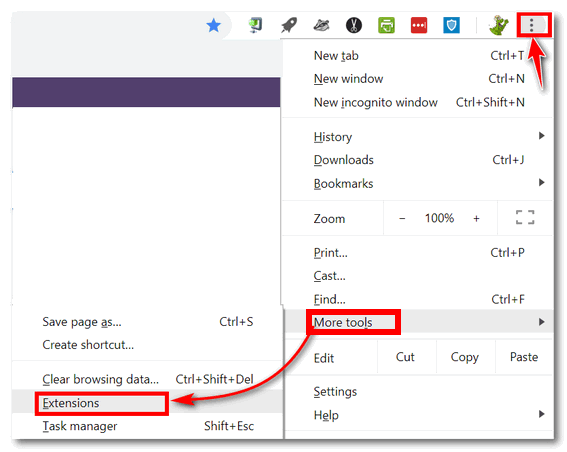 So, now you know how to turn extension on and off, and also how to remove extensions from Chrome. Our newsletter is sent from cloudeight-news / @ / thundercloud.net (you’ll have to put that together). AOL is part of Verizon & Yahoo now. If you want to receive our newsletter, you’re best bet is to get free Gmail address or Outlook.com address. AOL/Verizon/Yahoo will continue to censor and block your mail – but outlook.com and / or Gmail let you decide what mail you want to receive. And in this day and age – you really need to have at least one reliable backup email address. Excellent article. I have Emsisoft and if they think we need an extension on Chrome, then that’s what I did. I added it and I have no problems. They are a great company. I trust them like I trust you. Sorry some are having problems.